GH3D-394 | Size: 200 ml / 6.8 fl. oz. Studies show that about 60 % of women and 40 % of men have sensitive scalps, characterized by symptoms such as burning, tingling , pain, itching and redness. These problems are caused mainly by dry air, heat, cold, pollution, stress or even current shampoo. 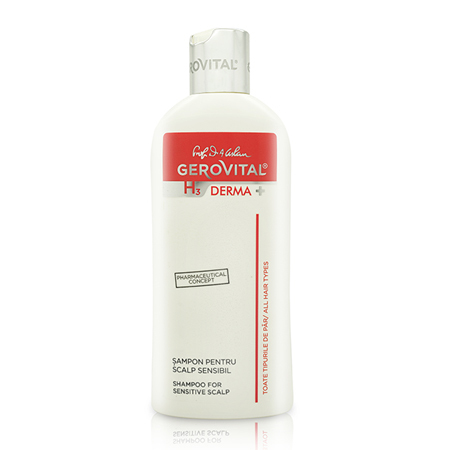 The Gerovital Derma+ Shampoo for Sensitive Scalp effectively cleans the scalp and hair and prevent dryness and irritation. It washes away dirt, pollen and allergens, and gives your hair a healthy shine and a soft, supple feeling. The content of Lactic Acid and Panthenol balance scalp microflora and prevents hair dehydration. Glycyrrhiza glabra (Licorice) has a powerful calming, anti-inflammatory, anti-irritant effect. Zanthalene® is an Ecocert validated CO2 extract from the fruit husks of Zanthoxylum bungeanum, a plant widely used in the Asian gastronomy as a spice. It reduces itching, irritation and discomfort of sensitive skin. Apply 2-3 times per week to thoroughly wet hair. Rinse really well and repeat allowing to act for 2-3 minutes. Rinse thoroughly. Apply 2-3 times per week to thoroughly wet hair. Rinse really well and repeat allowing to act for 2-3 minutes. Rinse thoroughly. Shake before use. INGREDIENTS: AQUA, SODIUM COCOAMPHOACETATE, UNDECYLENAMIDOPROPYL BETAINE, SODIUM LAURETH SULFATE, LAURETH-9, UREA, DISTEARYL PHTALIC ACID AMIDE, PEG-200 HYDROGENATED GLYCERYL PALMATE, PEG-7 GLYCERYL COCOATE, DIPOTASSIUM GLYCYRRHIZATE, CITRIC ACID, ZANTHOXYLUM BUNGEANUM FRUIT EXTRACT, OLEYL ALCOHOL, POLYQUATERNIUM-44, PHENOXYETHANOL, ETHYLHEXYLGLYCERIN, PARFUM, PANTHENOL, LACTIC ACID, SODIUM CHLORIDE, METHYLCHLOROISOTHIAZOLINONE, METHYLISOTHIAZOLINONE, MAGNESIUM NITRATE.